Well Pharmacy has told C+D it has reduced workload in its branches by 36% over the past three years, as part of its latest strategy to combat pharmacist stress. When asked how Well was helping reduce stress among its staff, Ms Baldock said its latest strategy is focused on “taking tasks out of our stores” and “allowing our colleagues to focus on the customer”. This strategy is in addition to its “wellbeing programme” – including gym discounts, financial support and education, and offering pharmacists wellbeing sessions in partnership with the charity Pharmacist Support – which the multiple says “is something we are looking to build on in the future”. Boots has also told C+D it has launched initiatives to tackle stress in its pharmacies, including its own collaboration with Pharmacist Support. 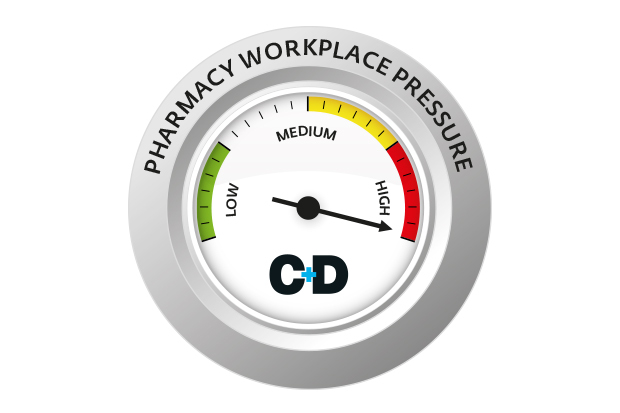 A briefing document – compiled by C+D from the past five years of Salary Survey data – revealed that stress levels among UK pharmacists rose six percentage points between 2016 and 2018, from 70% to 74%. Have you benefited from Well's strategy to reduce workload pressure? I left pharmacy in 2015 after 4 years at Boots. I now work for a large financial services firm, and can comfortably say that they do more to ensure the wellbeing of their staff than boots ever did. Our overtime levels are monitored, we have additional staff resource for known busy periods, we get more holiday and access to free 24/7 private GPs. In return, staff work harder. Well are moving towards Hub and Spoke and yes reducing dispensing workloads in branches however very much debatable if this will lead to any reductions in stress levels. Many thousands of Well employees are probably about to see their jobs relocated to central hubs, not just dispensors and delivery drivers but also 2nd pharmacists and relief pharmacists so stress levels certainly not '36% lower' for them. I expect a very difficult 2-3 years for Well staff including managers expected to oversee these changes and losing valued colleagues. Still, there's 20% off at the local gym. Thanks Well. Well's statement is a complete falsehood in my experience. The last internal employee engagement survey scores imply otherwise. THIS ARTICLE IS NOTHING MORE THAN AN ADVERT FOR WELL PHARMACY. They are losing pharmacists all over the various regions of the UK and have significant recruitment problems. This is because pharmacists are are not being treated with the professional respect & autonomy they deserve- there is a constant, unrelenting barrage of pressure from management to perform services and increase prescriptions with no thought of the wellbeing of staff etc They expect you do all this with limited staff support and poor working conditions. What a ridiculous claim that they have 'reduced stress by 36%'. How have you come up with this figure? Even if you were able to get such a quantifiable and meaningfull way to measure stress reduction, how can Well even apply this across their portfolio of branches? Each branch across different regions and divisions of Well has been so different over the last 3 years due to the partial implementation of new digital dispensing systems such as CAPA and Advanced Dispensing- which both failed abysmally! Plus every branch is different- different sizes, different levels of walk-in, repeat, mds and care home prescriptions, different services etc This means the stress level that comes with each branch is different. This is an arbitrary figure and nothing more than a pitiful attempt for Well to try and retain/attract pharmacists. The truth is, is that Well is currently implementing a new PMR across its stores and also moving towards hub and spoke dispensing. This will result in even more people losing there jobs in pharmacies and less staff support in branches. For Well to release this ludicrous statement on reducing stress levels just before it embarks on a period of great change in its pharmacies over the next few years, IMO is deceptive and misleading. I'd like to add when they decided to cut staffing hours in their pilot stores by 50%. That's a massive amount to cut, and resulted in a large number of people deciding, quite rightly in my opinion, to look for different employment. In my opinion, Well is only focused on becoming the next Pharmacy2U, and their latest nomination figures on NHS Digital are reflective of this. My one day a week in community pharmacy has become more stressful than the rest of the week put together. The staff and manager are stressed and overworked too. The once happy family is starting to fracture. Welcome to anxiety, hypertension and relationship breakdowns. It would be great if they can specify EXACTLY what are these roles and how they are now being handeled out of the stores. Let the readers decide if that is correct. Otherwise, this article is more of an advert for Well ! !